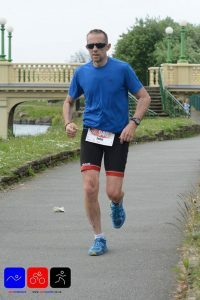 This is a well organised event, I think around 1400 athletes entered the various distances on the day, from the sprint to the standard, 2019 ETU Sprint Distance Qualifier, 2018 ITU Standard Distance Qualifier, Triathlon England National Standard Distance Championships, BUCS Standard Distance Championships. There was a lot going on. We were running a little behind when my wave started (wave 7) but not by much and not of any concern. The briefing for the waves was conducted on the ramp into the water and we started immediately afterwards. The weather on the day was near perfect, no wind, warm, and sunny… From memory I think the water was around 16 degrees! in the water. Black and smelly! We were grouped into around 20 or 30, perhaps more for some waves but there seemed enough space and although I got my legs swum over and goggles nocked skew, I think it was quite civilized. Twice around the island then out on the other side of the small bay. Head-checking is necessary to keep a good line and avoid rogue swimmers who seemed to be swimming for places unknown! For me the swim was actually better than I had expected. A practice open water swim the week before with the COLTS helped immensely and was probably the best bit of prep I did. I was a little faster on the swim than I thought I would be and left the water around in 31:41. Note to self to watch balance on getting out as I found all the turning of the head during the swim made me a little unsteady for a few steps on getting out. I needed a few paces to get my land head back on! T1 Transition was as planned but it’s a bugger to get the wetsuit off when you are hurrying, and I could have made it easier if I had removed my watch first! Timed as 6:19 this was longer than it felt. As I did in Kendal Sprint I had too much gear there and didn’t use half of it. But you never know with the weather I suppose, or at least I don’t. k god there was no headwind as I think this place could be truly brutal if there is a wind! Even so, being this flat made it challenging and strangely I found myself wishing for a hill or two and a bit of a break from the constant pedalling. In future I would treat a flat ride with greater respect and perhaps train with more specificity. 1:26 which is fast for me, but I got passed a lot. I think being new I am still getting the leg condition to really press on with the bike. Need some work there. T2. Once again transition was straightforward 3:30 this time as not much too do except grab a couple of gels and put the runners on. Finally, I found myself feeling at home here as my background is running and ultras. It was pretty warm, but nice to start pinching back a couple of spots (not many though!) The run goes around the lake twice, its well signed and marshalled and there is drinking water at the halfway 5km mark. There was no chance of taking a wrong turn or getting lost even with the weird double back, figure eight loopy thing half way through the lap. I think this was to get the distance up. So full marks to the marshals and directions getting people around there. Still no wind so again a relief. Finished the run in 59:13, not fast but happy. All up 3Hrs 7mins. I am very new to triathlons, so this is by no means a ‘how to’ of the business of racing them. Just observations and mistakes from a newbie on the subject and perhaps some insights too. Overall, I think this was a good triathlon. Results were texted to my phone within minutes of the finish which was great. The race was bigger than Kendal Sprint (my only other tri) and had the feel of a large event. Which I guess it was! Whether as part of a longer build towards something else (IM for me) or as a standalone event it would be well worth trying if you are looking for a nice day out by the sea.